President Obama may have a buddy-buddy relationship with big labor, but he’s no friend to ordinary workers. Here are four damning pieces of evidence. 1. The unemployment rate remains above 9 percent according to the Labor Department data released on Friday. 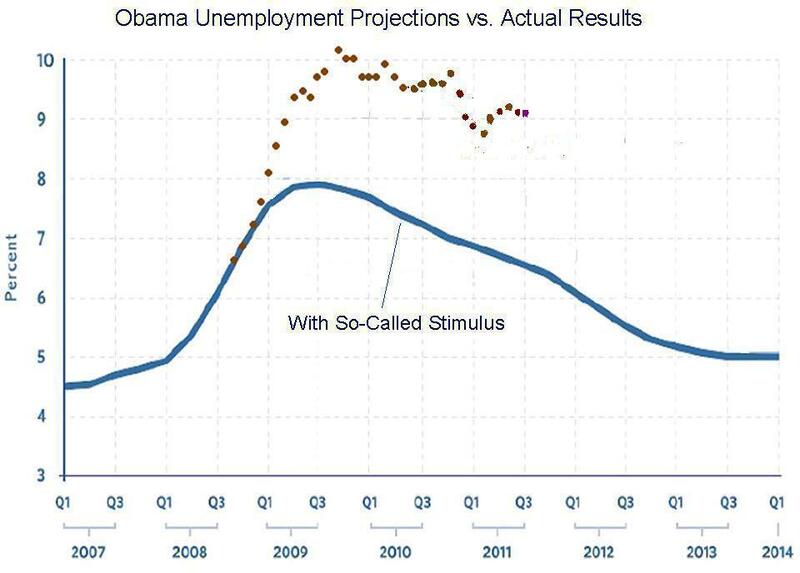 This is about 2-1/2 percentage points higher than Obama promised if would be at this stage if we adopted the failed stimulus. This is a spectacular failure. 2. Black unemployment has jumped to 16.7 percent. I’ve already commented on how Obama has produced bad results for the African-American community, and the joblessness numbers are rather conclusive. 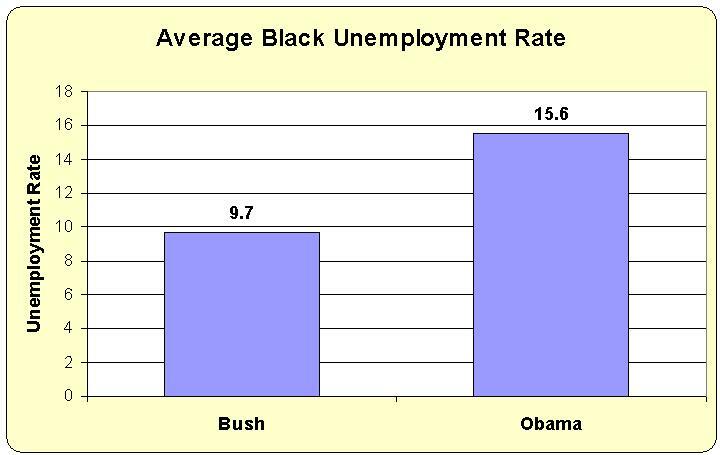 What makes that figure especially remarkable is that the black unemployment rate during the Obama years is more than 50 percent higher than it was during the Bush years. 3. 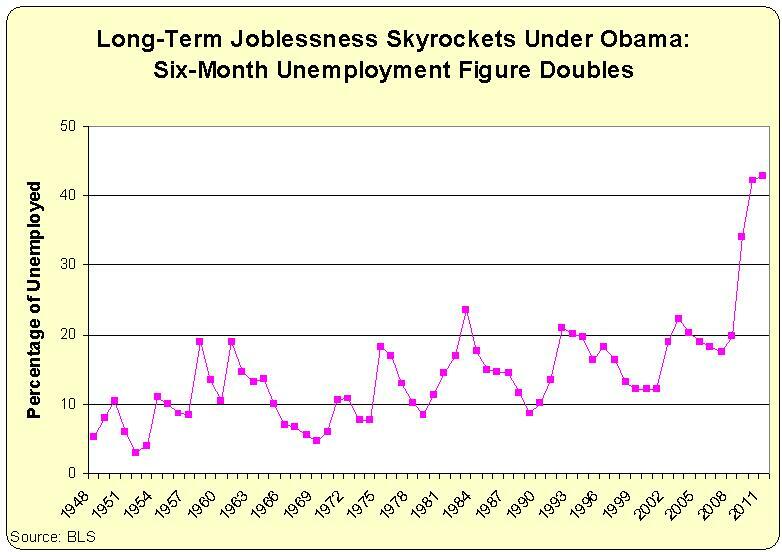 More than 40 percent of the unemployed have been out of work for more than six months. These bad numbers almost certainly are caused, at least in part, by the unemployment insurance program – as even senior Democrat economists have acknowledged. 4. Millions of people have dropped out of the labor force, dropping the employment-population ratio to the lowest level in decades. Here’s the chart I posted last month. It hasn’t changed, and it’s perhaps the clearest evidence that Obama’s policies are crippling America’s long-run economic outlook. All four of these charts are bad news. But the economy periodically hits a speed bump. The real problem is not bad numbers, but the fact that bad numbers have persisted for several years. And the really bad news is that there is little reason to expect a turnaround given the current Administration’s affinity for bigger and more burdensome government. We had a bubble and so this recession is different from the recessions at the beginning of the 1980s. But there was too very “tight money” before this recession. Very interesting post. Unemployment is still down since December 6th 2010 : On December 6th it became clear that the Bush Tax Cuts would be extended. 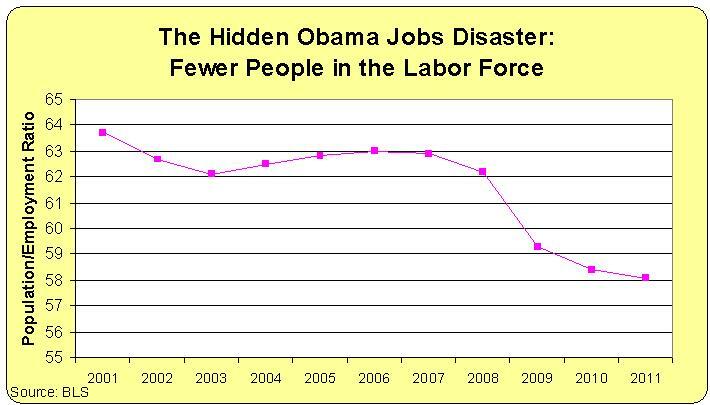 Unemployment went down steadily for several years after the Bush Tax Cuts were enacted in May 2003. There was the expectation that the Bush Tax Cuts would be reversed on January 2011. But, unexpectedly they were extended. There was a gigantic bubble that busted. If people are massively in debt because of a bubble then lower growth for several years may be expected because so many people do not want to take on more debt to invest. I think the USA may see somehow a replay of the 1990s Japan. But not as bad. This is not the typical recession where the Federal Reserve destroys lots of private investment, business loans, employment and growth by curbing credit (trying to intervene in prices)… Here there is a gigantic bubble that exploded and that makes this recession atypical. We are not facing the 1982 recession caused by Milton Friedman´s bad economic theories. I think this is different.